One of the tasks we sought to achieve when renewing our church was to improve the entrances into the building. There were practical reasons for this – the space under the choir gallery was dark compared to the rest of the church, and we knew that glass doors would appear more inviting to those passing by outside. Realigning the doors from the parish centre into the church has improved the flow of movement between the two spaces. Church doors and entrances also bear the important task of helping us make the transition to prepare our hearts and minds for celebrating together in a house of prayer. We pass back out through them again renewed with the task of taking Christ to the world. 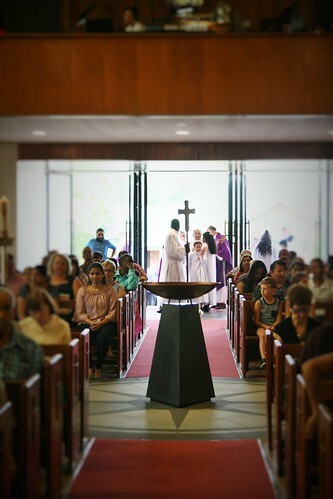 Church entrances are also part of a number of liturgical celebrations where entering the church forms a symbolic part of the ritual; some of these include the rites of initiation of adults and children, marriages and funerals. The design of our new doors not only serves the various liturgical needs and functions, but also honours our past. 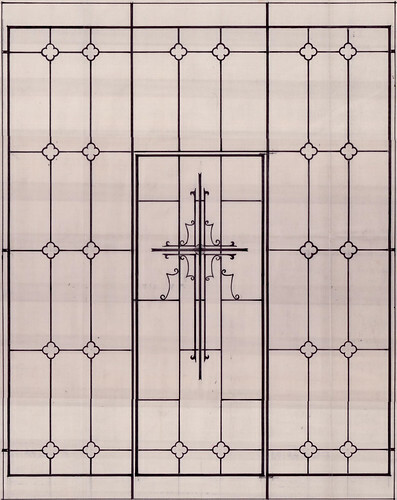 Our architect, Jesse Mowbray, used the architectural drawing of a grille for the baptistery from the original 1950’s plans as inspiration for our current door design. We hope that as we continue to celebrate in our renewed church, we can appreciate how our new doors contribute to an enriched life of prayer. Within the design concept for the renewal of our church, new doors will improve the flow of movement between the church and parish centre, as well as the natural light under the choir gallery. Light is a natural symbol of the presence of Christ. We are fortunate to have a church that is abundant with natural light, reminding us of the heavenly light and warmth of God the creator. This is less apparent under the choir gallery; the imposition of the gallery and the closed former entry doors limiting the light in that space. The glass doors proposed to replace the current entry doors will provide much more light in this area. The same doors will be positioned further forward than the current doors. This will allow us to expand the area at the entrance, improve the sense of transition between exterior and interior, and provide space that will help support people’s personal and devotional prayer. A new awning at the entrance will ensure that the entrance remains adequately sheltered. To be suitable for a procession of vested ministers led by a processional cross held high, the entrance is designed with appropriate gravitas. Something we have learned from using our parish centre is that the doorways between it and the church are narrow and too short to accommodate a liturgical procession (making sure the door frame doesn’t collect the processional cross on the way through is an art our servers have had to perfect!). The new doors for our church will be designed with greater proportions to better serve this ritual action, and again improve the flow of movement of people in and out of the church. Architecturally and symbolically, doorways and thresholds are significant places, linking two different kinds of space. In a church, the transitional or liminal space of the narthex marks the movement from introductory activities and rituals to the sacred action of the liturgy itself where the Body of Christ is constituted for worship and where the people enter into the mystery of God’s saving action. Door from the Benedictine Abbey Church of Montecassino, Italy – clearly not a door you would find for sale in your local hardware store! The new glass doors that we propose to install are of glass construction, with a decorative metalwork screen. The glass will let light into the church, and allow passers-by to see inside, which will help to make the entrances and the church more inviting. 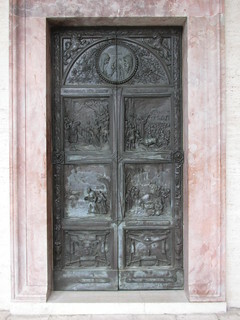 The metal screens on the doors relate directly to original design plans for the church, and provide a design that sets them apart from other common doors. This will help to define the church as a special, sacred space with a particular purpose, and highlight the church doors as an important point of transition and movement into a house of prayer. Fr Paul is currently sharing with everyone the design concept for the renewal of our church. In developing the concept, we asked the architect, Jesse Mowbray, to improve the flow of movement between the church and parish centre, as well as the natural light under the choir gallery. In the liturgical celebrations of baptism, marriage, and funerals provision is made for a rite of reception at the doors of the church. On certain days of the liturgical year, the faithful pass through these doors in procession into the body of the church. It is proper, then, that in construction, design, and decoration church doors should stand as a symbol of Christ, who said: “I am the door, whoever enters through me will be safe,” and of those who have followed the path of holiness that leads to the dwelling place of God. The entrance to the church has a liturgical purpose and function, as is demonstrated we celebrate Palm Sunday each year. They serve as means of helping us make the transition from the world into a house of prayer, and back out to proclaim the Good News. On countless occasions over the centuries, church doors have also been a source of protection, keeping out those who threaten the Christian faith and providing sanctuary to those within. As such, the entrance to the church is more than just a set of doors! During the course of this year, we will gradually begin to use the texts of the revised translation of the Roman Missal. This is not just a time when we need to learn new words, but will hopefully be an opportunity to come to a deeper understanding of the Mass. Here we will take a closer look at what happens at Mass. After the people have gathered, the Entrance chant begins as the priest enters with the deacon and ministers. The purpose of this chant is to open the celebration, foster the unity of those who have been gathered, introduce their thoughts to the mystery of the liturgical season or festivity, and accompany the procession of the priest and ministers. The Entrance is the first part of the Introductory Rites. The chant or hymn, as you can see, is an integral part of the celebration, not just an “add on” or “optional extra”. The entrance hymn has a far richer purpose than simply providing accompaniment for the procession. During the Mass, the entire assembly gathered together to celebrate the Eucharist forms one body in Christ. One of the purposes of the entrance hymn is to build up the sense of unity amongst us. It also helps us to direct our minds and hearts to what it is we are about to do and celebrate. As such, the entrance hymn shouldn’t end as soon as the priest reaches the presidential chair. Music ministers have the important task of trying to sense how long the hymn should be. It can be almost impossible to determine before Mass begins. Often longer is better, especially as some people may still be coming in the door quietly looking for a seat, that a sense of unity in such a large group of people doesn’t happen instantly, and that the priest and ministers need time to reach their places, gather their thoughts, and hopefully join in as well. To say, for example, that we should only ever sing a couple of verses of a hymn doesn’t take into account everything the hymn helps us to do.